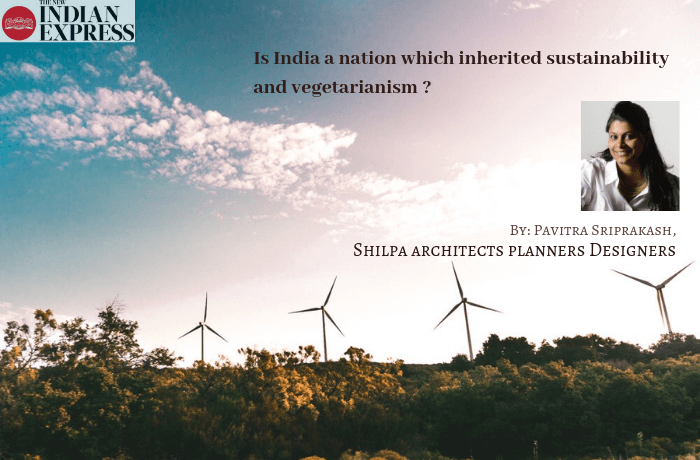 ECOLOGIC : Is India a nation which inherited sustainability and vegetarianism ? Is India a nation which inherited sustainability and vegetarianism ? Indians have always been sustainable and green — it is only today that the rest of the world is putting a label on it — thereby making it seem like we need to adapt — but we have inherently been a green nation — I have heard many such statements by patriots that like to quickly type cast our “inherent” selves. This however is to be argued. We may have been a design and eco-sensitive nation at a very early stage of our civilization, but post-independent India has been grappling with a sense of design identity and also environmental sustainability. Very few of our buildings or cities have been developed with the ideas of being resource efficient — it has only been cost efficiency which is a driving factor. In many cases the effects of value engineering can be disastrous for what it means for the environment. Starting with the cities, this effect is soon visible in rural India as well. A recent visit of mine to a small village outside of Udaipur proves this point very well. I found that the construction from the 1600’s used local stone walls which were over 2’ thick with extremely well finished mud and lime plaster. Newer buildings, on the contrary, even in the smallest villages were now made of standard 8” walls of concrete blocks with cement plaster. There is very little know how in the handling of local material and there are no contractors that will work in this ‘old fashion’ anymore. With this being the current state of the building industry – how do we re-learn that local methods and materials are the sustainable way to still make buildings of a certain type and scale? There is little data that studies or understands how the efficiency of older building technologies and design interventions across India stack up against the new simulated age of energy efficient building design and resource usage. In order to understand Indian stereotyping, let us look at a more understood area with some newly found data – Food! The popular belief which exists around the world is that India is a nation of vegetarians. But new research by US-based anthropologist Balmurli Natrajan and India-based economist Suraj Jacob, points to evidence that even this may not entirely hold true. The researchers claim, based on their data, that only about 20% of Indians are actually vegetarian. The data then further goes to disprove many other commonly accepted beliefs — Chennai — best known as the land of the ‘vegetarian thali’ is only 6% vegetarian in reality and Punjab — the state of ‘butter chicken’ is actually 75% vegetarian. So, it is worthwhile to draw a parallel to breaking stereotypes instead of just believing that we are inherently sustainable or largely a country of leaf-eaters —inflated estimations in both these aspects can be attributed to “cultural pressures”. It is now clear that people under-report eating meat and over-report eating vegetarian food! We could find the same being true for Indian architecture as well — it has not been green for as long as we believe!